Peyton Manning #18 of the Denver Broncos celebrates with the Vince Lombardi Trophy after Super Bowl 50 at Levi's Stadium on February 7, 2016 in Santa Clara, California. The Broncos defeated the Panthers 24-10. Peyton Manning got through the weekend thanks to hundreds of texts and calls from men he played against or alongside over his unparalleled 18-year NFL career. 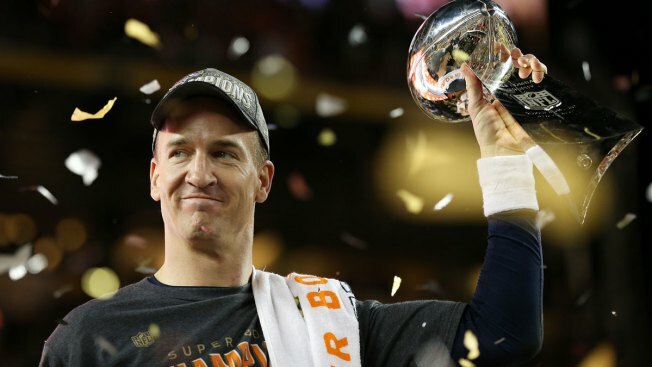 "I thought about it a lot, prayed about it a lot ... it was just the right time," Manning said. "I don't throw as good as I used to, don't run as good as I used to, but I have always had good timing." Manning is going golfing later this week with brothers Cooper and Eli — whose trip to Denver Monday morning was scuttled by a stomach bug. "I'm totally convinced that the end of my football career is just the beginning of something I haven't even discovered yet," Manning said. "Life is not shrinking for me; it's morphing into a whole new world of possibilities." "When I look back on my NFL career, I'll know without a doubt that I gave everything I had to help my teams walk away with a win," Manning said. "There were other players who were more talented, but there was no one could out-prepare me, and because of that I have no regrets." Elway thanked Manning for coming to Colorado, saying he made his own job easier, noting that with Manning living here, free agents were basically asking Elway "where do I sign?" "Peyton Manning revolutionized the game," Elway said. "We all used to think a no-huddle was a fast pace, get to the line of scrimmage and get people off-balance. Peyton revolutionized it, and you know what, we're going to get to the line of scrimmage, take our time, I'm going to find out what you're doing and then I'm going to pick you apart. "I can't tell you how many times I said, 'Dang, why didn't we think of that?'" "He had nothing," Helton recounted. "But I knew he'd come back and be Peyton Manning again because nobody else works that hard." Team president Joe Ellis told Manning, "If there is a list of achievements needed to attain greatness, you've checked every box." Elway was equally emotional when he walked away from the game after winning his second championship in 1999, and on Monday he said, "Having been through it, I know it's a hard day for him." "I know it was tough, and you were special along the way," Kubiak said, turning to the five-time MVP. "So, it was only nine months for me, but I'll remember it for a lifetime." Manning revealed after the news conference he had an "orthotics guru" who had also helped other NFL QBs take up shop in his garage last November to fit him with some orthotics that helped him get back on the field. He added the torn ligament near his left heel feels fine and won't require surgery in retirement. All of the responses and conversations "kind of helped me through the last day and a-half," Manning said. "This is a joyous day," he said, "and nothing could overtake this day." Earlier, reciting from Scripture, he said, "I have fought the good fight and I have finished the race." "Well, I've fought a good fight," Manning said. "I've finished my football race and after 18 years, it's time."